UW Rowing owns an enviable place among intercollegiate crews as Husky student-athletes practice and compete along in-city waterways to the delight of knowledgeable, impassioned fans. “They call us Rowtown, USA,’ and our fans and donors help us earn that title,” says Women’s Head Coach Yaz Farooq. This past summer, the best rowing university in America traveled to England to compete in the sport’s most historic races, the 179-year-old Henley Royal Regatta. Up against the world’s top rowers, the Washington Men’s eight won the Temple Challenge Cup, breaking the event record by five seconds. 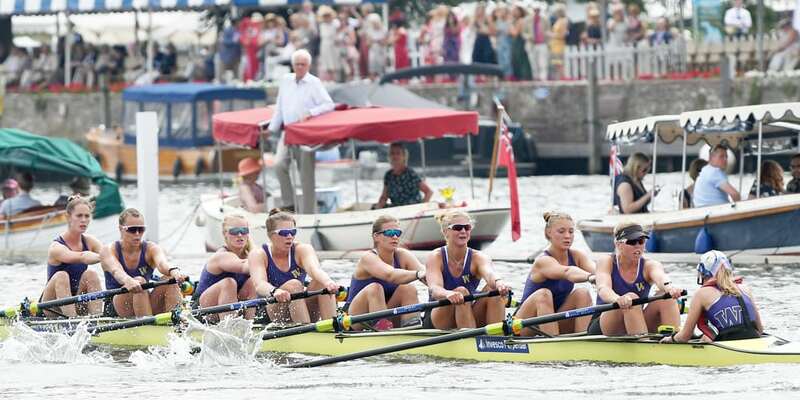 The Women’s eight made it to the semifinals before falling to England’s national team, while the UW’s Anna Thornton and Charlotte Hodgkins-Byrne won the Stonor Cup in double sculls. The UW Rowing Stewards, the 101 Club Foundation and other loyal supporters raised the funds to help send Washington to Henley.